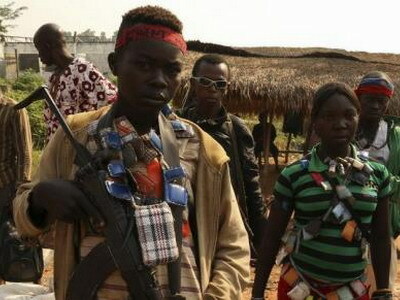 One of Sudan’s largest rebel groups, the Sudan People’s Liberation Movement-North (SPLM-N), signed an accord with the United Nations to end the use of child soldiers. There has been fighting between the Sudanese army and rebels in the southern regions of Kordofan and Blue Nile since 2011, when adjacent South Sudan declared independence. Conflict in Darfur began in 2003 when mainly non-Arab tribes took up arms against the Arab-led government based in the capital Khartoum. Talks to secure a lasting ceasefire in the three warring regions under a road map for peace collapsed earlier this year, less than a week after they began. SPLM-North chairman Malik Agar signed an action plan at a ceremony in Geneva outlining measures to end recruitment of children under the age of 18 and release those currently in the group’s ranks. “SPLM-N is firmly committed to the protection of children in conflict and today’s signing is a continuity of that commitment,” Agar said following the ceremony. Neither Agar nor UN officials present at the ceremony provided figures on the number of child soldiers involved in the conflict. A UN statement said the group would be removed from a list of parties accused of child recruitment in its annual report on children and armed conflict upon completion of all steps agreed to in the action plan. UN officials said they signed a similar agreement with Khartoum in March 2016 and hoped to complete more with the country’s other major rebel groups.